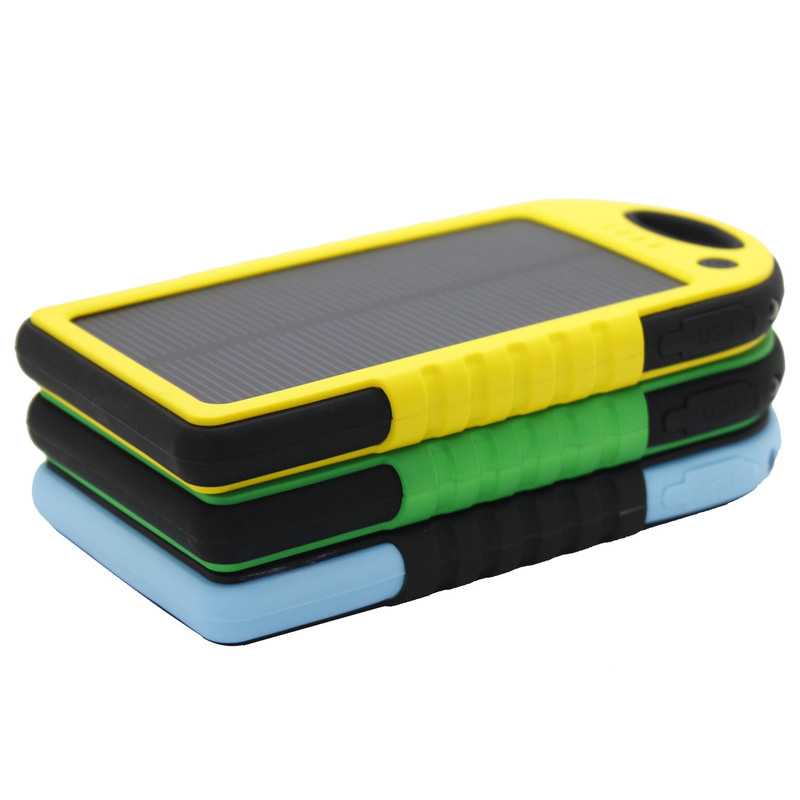 Weatherproof Solar Phone Charger. External Battery Pack for Iphone, Android, Galaxy, Ipod. Portable Phone Charger with High Capacity Power Bank (5.000 Mah). This Portable Cell Phone Charger Is Water-resistant, Dustproof and Shockproof. Great for Outdoor Use (Boating, Hiking, Camping, Beach). The Power Bank Can Be Charged Via the Solar Panel or Through an External Power Source (Usb Ac Adapter). You May Also Use It As an Ipad Solar Charger or Power Bank. This beautifully designed sport solar charger integrates a powerful 5,000 mAh power bank with a 1.2 W monocrystalline solar panel. The power bank can be charged using an external power source (USB AC adapter) or through the solar panel. The charging through the solar panel is slower since the panel is small. It has dual USB ports for connecting two devices at the same time. Compact sport design with an attractive rugged case that is water-resistant, shock-proof and dust-proof. Dimensions: 142x75x13.6mm, Weight: 150 grs.It comes with a carabiner so you can easily attach it to your backpack. Compatible with 5V USB-charged devices. This includes smartphones, Iphones, Ipads, Ipods, Adroids, Samsung Galaxy S4 & S5, Tablets, MP3s, GPSs, and many other devices. Can be charged using an external power source (USB AC adapter) or through the solar panel. Place the solar charger under sunlight. 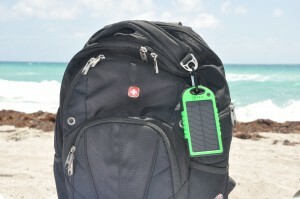 The green LED indicator will keep on when the solar charger is being charged under sunlight. When the solar charger is fully charged, LED indicators goes off. Connect the solar charger’s cable to a computer or laptop USB port, or USB AC adapter. Blue LED indicators come on to indicate that the solar charger is being charged. 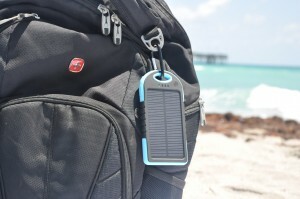 An external power source takes 5-7 hours to fully charge the solar charger. The solar charger needs to be fully charged if you wish to utilize both USB ports and charge two devices simultaneously. NOTE: When the solar charger is in use and its battery charge level is very low, the solar charger will automatically shut off in order to protect its battery from a deep discharge. When the solar charge begins to recharge, it takes 3 minutes before it can output any charging current. Double-click ON button to switch the torch on and off. Never attempt to open or dismantle the solar charger. Never subject the solar charger to knocks or blows. Do not let children play with the solar charger. 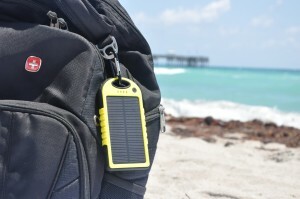 The solar charger is water-resistant but should never be immersed in water or any other liquid. Do not leave the solar charger in airtight space when sunshine charging such as a car, may cause the maximum operating temperature (45C) to be exceeded. Do not throw the solar charger into the fire. Received the solar charger last week. It was fully charged in 3 hours! Love the flashlight as well. It’s lightweight, strong and durable. I would highly recommend this product to all my friends and family. Great product! I give it a 10 out of 10!!! Y2d2 – Waterproof Portable Phone Charger. Waterproof Portable Phone Charger | lijofederi on Y2d2 – Waterproof Portable Phone Charger.